Such a dramatic look. Loving the floral details. 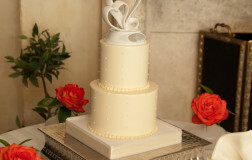 Two tier cake shown in vanilla butter cream frosting. Floral accents were provided by the bride. Be the first to review “Bold Statements 47” Click here to cancel reply. 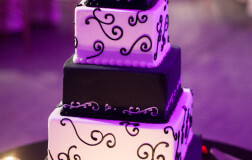 Such a cute wedding cake. 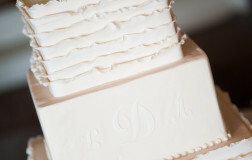 Although most of these accents were provided by the bride, we could customize them to made edible; please inquire. This is an interesting design for the Modern inspired. 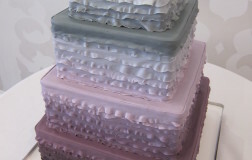 Ombre has become the popular choice for weddings. These color tones are trendy and sophisticated. Loving it! It is interesting to see each tier be a different color. It works since the colors are soft and are complimentary to each other. 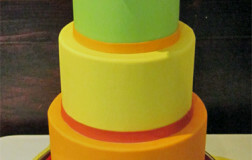 While the original colors on this cake were slightly digitally enhanced, this cake still makes a remarkable presentation. Who doesn't love ruffles! Delicate and striking. 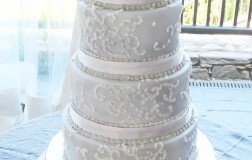 It is hard to see, but the second tier has monogram initials on it. 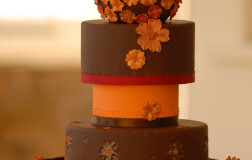 The color contrast on this cake is amazing. 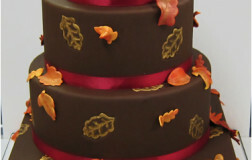 Some of the leaves are hand painted while the others were cut, stamped and painted for depth. 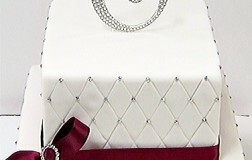 This is a great design but keep in mind that the Swarovski crystals on the tiers are not edible and should NOT be consumed. These crystals must be removed prior to serving. 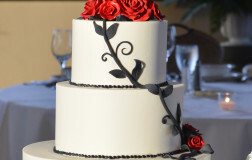 Not typically the colors for a wedding cake but look at the dramatic look! 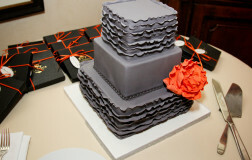 This modern wedding cake is infused with artistry, construction and detail for the bride who is not afraid to be bold! 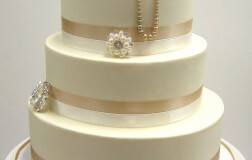 We love designing custom cakes; the detailing is original and so elegant and delicate on this cake. 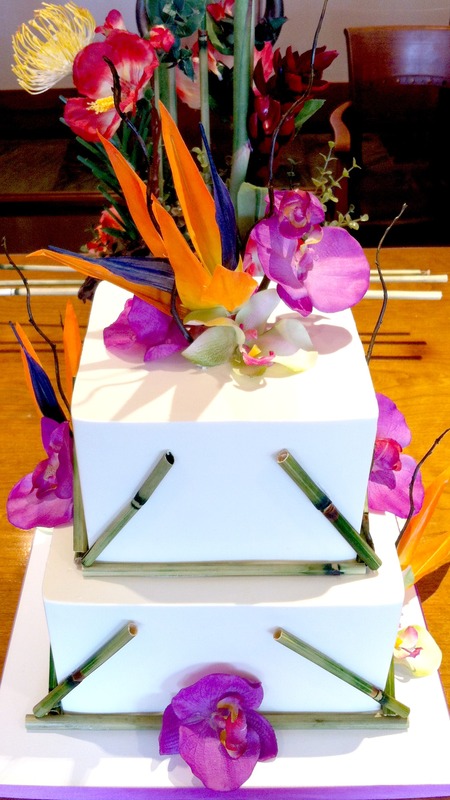 This is such a beautiful and vibrant, tropical themed wedding cake. 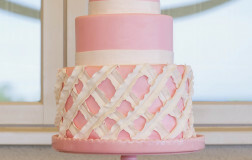 Love the entire presentation of this cake; so fun! 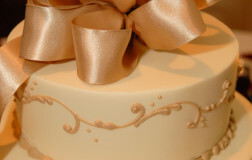 This is a perfect cake for anyone having a smaller and more intimate wedding. 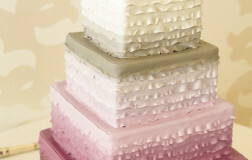 You can still have a tiered wedding cake even if you only serving a smaller guest count. 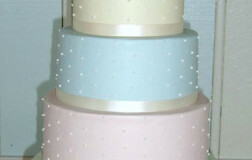 Who would have thought that these colors would look so amazing together....it so works!!! I remember this cake very well. 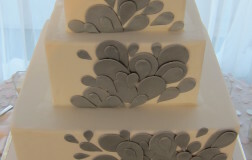 It was probably one of the most symbolic and unique wedding cakes that we have made. 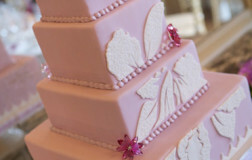 It was customized by the bride, who was an architect. It barely fit in the fridge. 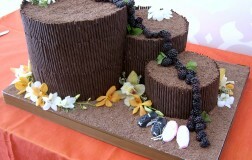 I also remember how long it took to place the chocolate cigarettes on!!! Notice the running sneakers; that is how the couple met...running. This cake represents the trail that they ran on. 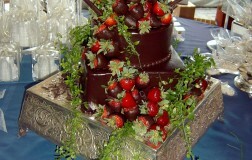 I am sure this cake caused a dramatic and quite an unexpected reaction from the attending guests. Great colors and a bold design...just love it!